This week I spoke with philosopher, novelist, filmmaker and investigative journalist Andre Vltchek. Vlchek has covered wars and conflicts in dozens of countries. Three of his latest books are his tribute to “The Great October Socialist Revolution” a revolutionary novel “Aurora” and a bestselling work of political non-fiction: “Exposing Lies Of The Empire .” His other books can be viewed here . Also be sure to watch Rwanda Gambit , his groundbreaking documentary about Rwanda and DRCongo and his film/dialogue with Noam Chomsky “On Western Terrorism” . 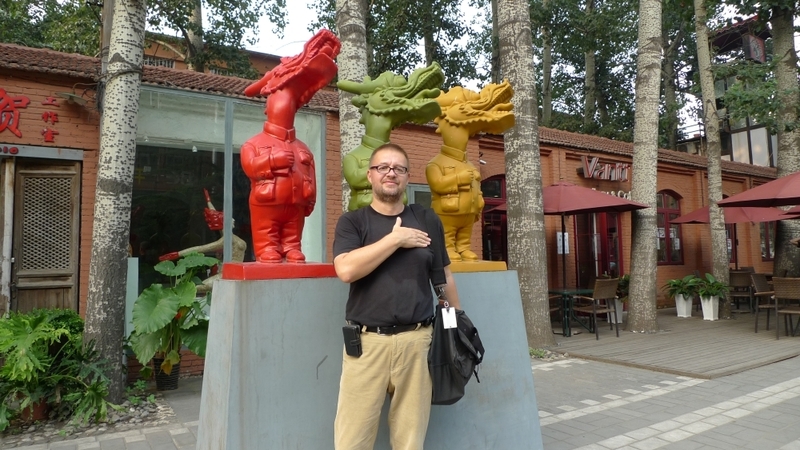 Vltchek presently resides in East Asia and the Middle East, and continues to work around the world. He can be reached through his website and his Twitter . Could you give readers a background of who you are and what influenced you to take the path of independent journalism and analysis? A: First of all, lately I do not define myself as a journalist. These days, journalism is synonymous with ‘the oldest profession.’ I document the world, I inform people, and I propagate my political ideas. I don’t believe in “objective reporting” – it simply does not exist, and those who claim to be objective, like the BBC or The New York Times, are actually the most professional propagandists for the Western Empire. I may be a propagandist, too, but for the left, for internationalism. And I never hide who I am and where I am standing, politically. In the years I’ve followed your media work, you have covered such topics as neo-colonialism, the role of the Soviet Union in the rise of internationalist politics, and the little known imperialist wars on Syria and the Democratic Republic of Congo, to name a few. Could you tell me more about what led you to seek the truth on these matters? A: I witnessed terrible suffering of people in Africa, Asia and the Middle East. It often appeared that the Empire truly saw billions of human beings as ‘non-people,’ as some lowly beings who deserve to have no rights, who could be freely exploited, enslaved, even killed. This arrangement of the world made me sick, from my young age. It made me so sick, that I decided to get involved, to take action, to join the struggle against Western imperialism and neo-colonialism. In your bio, I’ve noticed that you have written for Russian and Chinese outlets such as RT, New Eastern Outlook, and The People’s Daily. What is the difference, in your opinion, in the quality of journalism that emanates from these countries as opposed to the US and West? Media outlets that you mentioned belong to the countries which are fighting against Western imperialism and its global dominance. These countries are my allies; therefore, I write for their media, I make films for them, and appear on their television networks. It is not only Russian and Chinese media, but also several outlets in Latin America and the Middle East. What is different about them? They serve their nations, their people, not some corporate freaks. I like when people work for wellbeing of their countries: I like healthy patriotism, especially when it is combined with the internationalist principles. How has the media landscape in the US and West changed since you became a journalist and how have such changes affected broader efforts to understand the developments and changes occurring worldwide? Media landscape in the West is evolving in one direction only: it is being increasingly, now almost exclusively, controlled by the corporate interests. Corporate interests, in turn, are controlling the state, in both Europe and North America. There is no democracy in the West: governments are being selected, not elected. Most of the media is upholding, glorifying this process. It is definitely not challenging it, philosophically and ideologically. In the past, long decades ago, there was at least some philosophical debate about the direction in which our civilization and our planet evolving. Now it all stopped. Mass media became synonymous with imperialist propaganda. It is all very well-orchestrated; choreographed. And people in the West are so thoroughly brainwashed that they stopped asking questions regarding the most essential issues. Since late 2016, the US and Western corporate press and political establishment has been obsessed with the notion that Russia has infiltrated US and Western democracy, influencing elections through the promotion of “fake news.” This accusation has produced grave consequences for alternative media outlets and journalists, as publications such as RT and Black Agenda Report have been labeled dupes of the Russians and subsequently censored by internet search engines such as Google and social media like Facebook. Has social media censorship affected your work at all and what would you say is the significance of this campaign against independent journalism? In the future, and may this future come soon, those who are performing this outrageous censorship, will be judged by history and labeled as collaborators with the Western imperialist regime, which in turn is synonymous with fascism. In the meantime, we are now fighting information, or call it a media war. The Western media is directly and indirectly promoting Western imperialism, while some independent media outlets, including Black Agenda Report, and of course many non-Western television stations and publications are doing their best to expose the lies and crimes of Western regime and its journo collaborators. You recently wrote a piece criticizing the Western left for abandoning the principle of internationalism. Could you elaborate on your argument and relate it to the question of which way forward the alternative and independent media should go in the current political climate in the US and West? Yes, I wrote a very critical, some would say damning essay, basically claiming that the Western left is finished and has no right to give advice to any revolutionary country or government in Africa, Asia or Latin America. And if they give advice and are taken seriously, progressive countries end up being defeated, like Argentina and Brazil were defeated, recently. I don’t even trust the Western left when it criticizes politicians like Zuma or Duterte. I will say more, and this will hurt: they are, many of them are, racist. Not racist in traditional sense, no. They talk racial equality, they are politically correct. It is different type of racism: they do not mind if millions of Congolese people are sacrificed, so the French workers could have shorter working day or better medical benefits. They are also convinced that countries like China with much greater culture than the West, could and should be judged and defined (“Is China really a Communist country?” For instance) from London, New York or Paris. It is so pathetically arrogant! It is grotesque. What are some projects and organizations, if any, that you are working on right now and where can we find your work? I cooperate with many internationalist media outlets all over the world, be they in Russia, China, Latin America, the Middle East or Africa. Best way to follow my work is by going to my website . All my latest stuff is there. As always, I’m running myself to the ground, working day and night, but it is as always great fun! In one month or so, my new book on revoltionary philosophy will be published with the title “On Western Nihilism and Revolutionary Optimism.” I’m making two documentary films about the absolute environmental devastation of Borneo Island, particularly its Indonesian part (called Kalimantan). And I’m collecting footage in Afghanistan, for a low budget feature film. I’m also writing a book about that wonderful but scarred country, and about how the West totally perverted modern Afghan history. I’m involved in a theatre project in Hamburg, and I’m writing two new books. There is no time to lose. This is a great intellectual war against the West and its deadly imperialism. And for the first time in modern history, we are winning this war. And ‘they’ know it. That is why they are running amok, attacking, censoring, Soon, no one will be taking them seriously. This is our great chance. That is why we have to work day and night, every day and every night, until the final victory! Danny Haiphong is an activist and journalist in the New York City area. He can be reached at wakeupriseup1990@gmail.